… and immediately thought that this would be EXTREMLY #awesomesauce to have. I am grateful that at least two of them, namely Ryan Yates and Amanda Debler shared their prompt function here and here - and I mixed both of them and came up my version. If you open a PowerShell session and type in a command, every time you issue it, the Prompt() function defined in the path C:\Users[USERNAME]\Documents\WindowsPowerShell\Microsoft.PowerShell_profile.ps1 is executed. How cool is that. A prompt override! So if you want to edit your Prompt() function you can open a new PowerShell session and type code $PROFILE or if you dont have VSCode (?!) installed notepad $PROFILE to open the file. Only the last two folders and the root drive is shown in the current path. Colored in green if the execution time is below 1 second; milliseconds are shown. Yellow if the time is below a minute; seconds are shown. Red if the time is above a minute; hours, minutes and seconds are shown. If you have a script that runs longer than a day (really?!) then you might have to fix that. If you are in a path that is a git repository, the branch and the state is shown. You need Posh-Git installed - with chocolatey its choco install poshgit. And it even works in VSCode. Note the posh-git path at the very end! #Adjust your post-git path! I installed it with chocolatey! The only “disadvantage” I noticed is, that the initial load of the PowerShell is delayed by 1 second. I guess thats because the post-git module is loaded. That is acceptable. 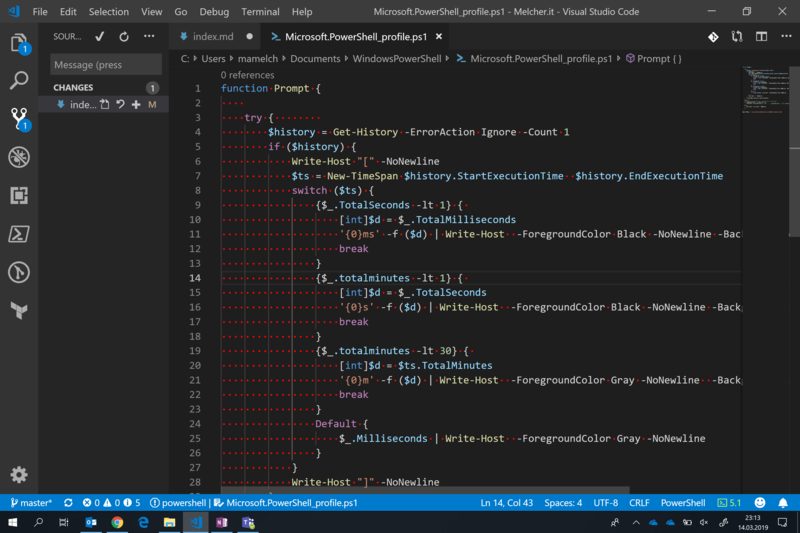 I thought about moving the path and the execution time to the PowerShell console title - but that would not work in VSCode so I left it. Still liking the idea, maybe it is something for you.